You know the adage: a person's home is their castle? Well, there's a tiny house on wheels in New Zealand that virtually transforms into a dwelling that resembles a medieval fortress when parked. How is that possible? Many of the wheelie crib's space-making elements were design to unfurl into place. When it's to hit the pavement, the compact "castle" folds back up to become a road legal vehicle. The side entrance to this tiny, abode has a few unique features. First off, the castle truck is an off the grid dwelling that's both solar and gas powered. Above the side entrance (shown here) is the solar array. The photo shares another ingenious feature built-in to this small home. The folding entryway doors transform the dwelling's interior into an outside room. The two turrets at the rear of the Transforming Truck Castle conceal three of the small abode's functional features. The left tower houses a composting toilet and the right tower is home to both the shower and washing machine. 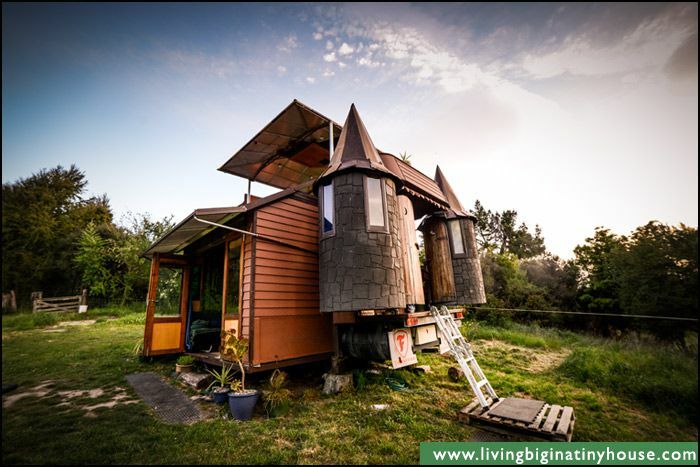 This castle truck is chock-full of practical features including hidden storage, a kitchen stocked with full-sized appliances, a cozy sleeping loft, and a large rooftop deck equipped with a bathtub. You can see all these features and extra in this video ​tour.